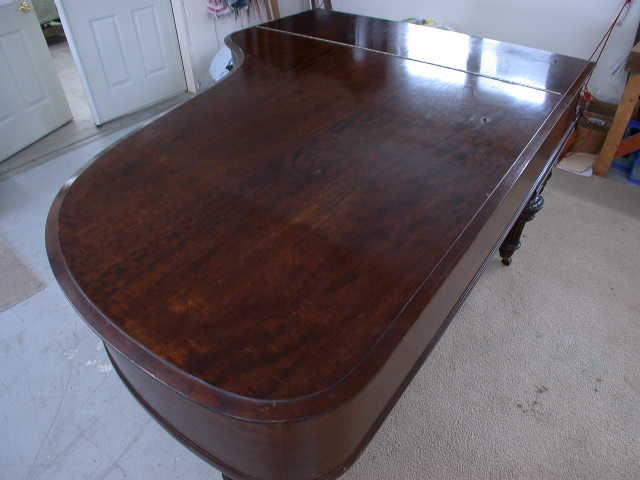 We treated refinishing, like voicing, or rebuilding, in thinking it is best done by finding a piano that is where you want yours to be. 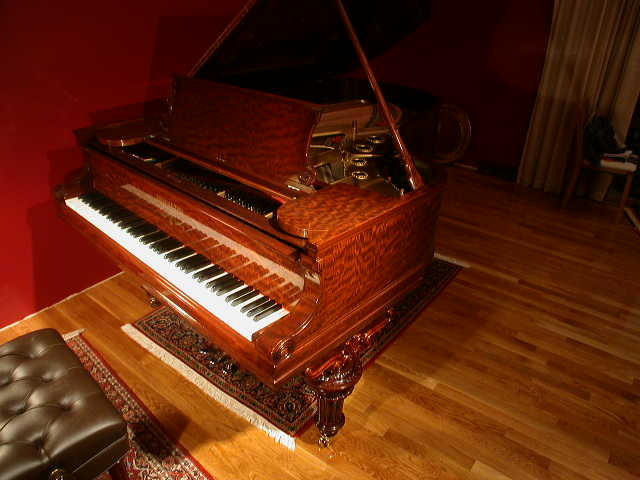 In this case, it was easy once we saw the finish on this 1904 S&S C. One year older than ours. I'd say it could have been the same tree, but probably not. 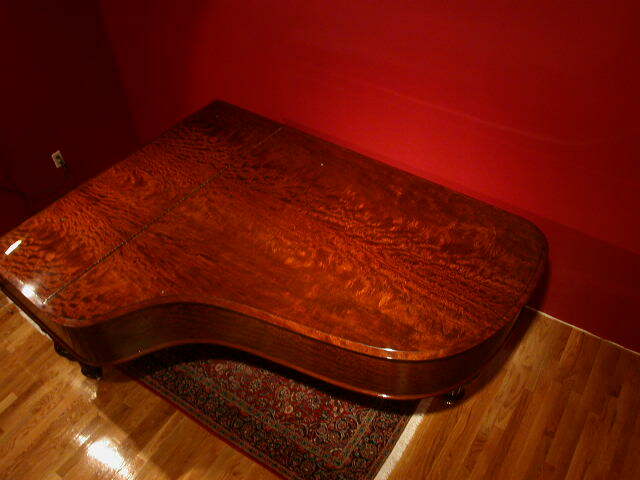 This mahogany cut is highly uncommon on new pianos, but there are a number of Steinways that had it from this era. The terms flame, ribbon, and honduras are almost interchangably used. 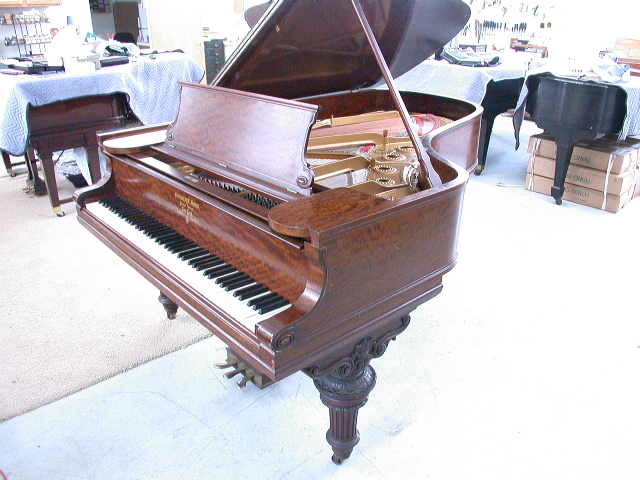 While I don't think its ribbon mahogany, I will say most described it as a process of veneering that is highly governed by the angle of cut more than by selection, or the origin, of the wood. In fact, it theoretically could be reproduced today, despite ads suggesting the contrary. Here, some shots of the lid before, during and after. There was some sun fading and a poor attempt at stain correction near the tail. This obscured the work of the craftsman who originally booked the veneers. Now, re-awakened it almost looks like crotch mahogany. One thing the website won't do is show how this type of grain "flip flops" as you walk past. It is almost like those old baseball cards that had two pictures on one depending upon how you held them. Note how overexposed the picture was to reveal the grain under the aged finish. 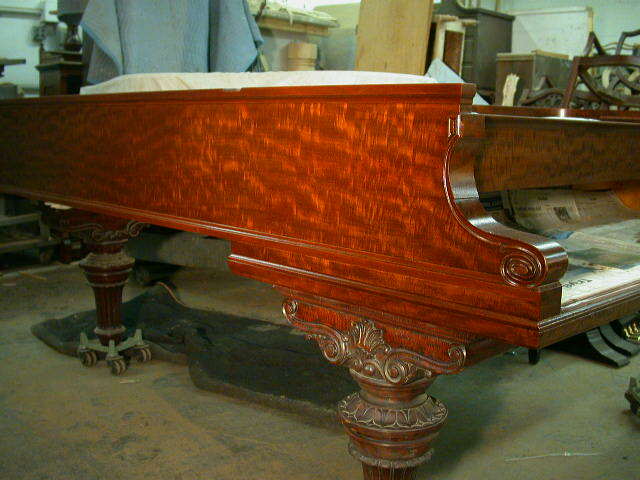 With only sealer and stain, you can see a dilema that was reached with this piano that is worth describing as just one of the forks in the road refinishers of old steinways face. 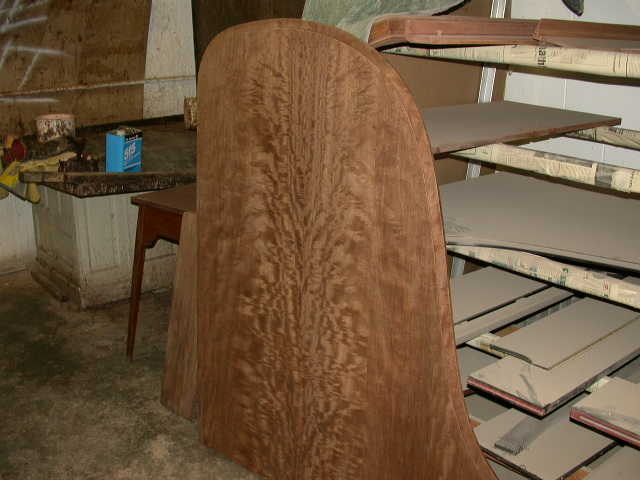 The legs are all maple underneath a finish that was "feauxed", or faked, at the factory to look like the mahogany above. 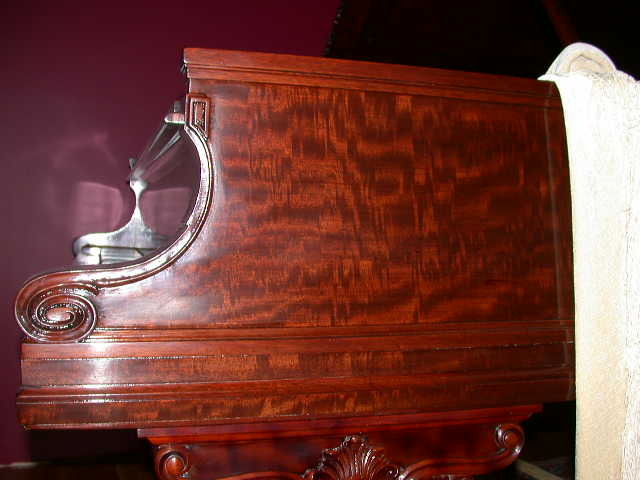 Mahogany could have been used for them and, as I understand it, it sometimes was, but more commonly maple was selected in legs for its strength and then either ebonized or had done to it what was done here. 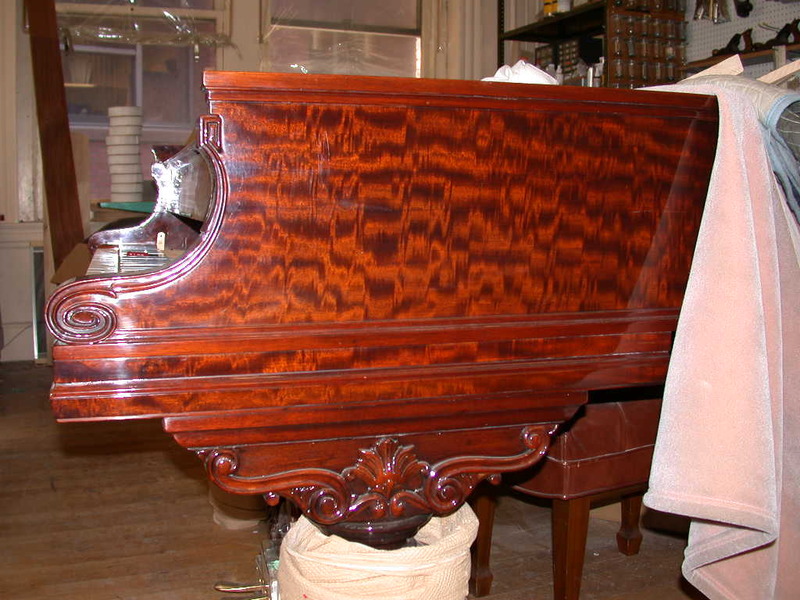 A refinisher may either retain the original feaux and deal with the years of aging, cracking and darkening, by cleaning them with a solution and then rubbing them in a process that solves the remaining lacquer and somehow smoothes it again, or they may simply take the leg down to bare wood which guarentees a cleaner surface look, but puts them back in the position of having to make maple, whose color let alone grain, is nothing like mahogany. Here is a shot of what I think is ribbon, or straight cut, mahogany. 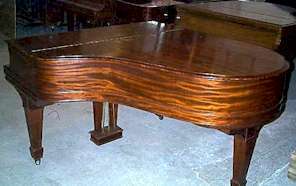 I believe I've also heard the origin of this veneer being Africa. You can now see how different at least these two varieties of the same wood are. Anyone who feels they know better is welcome to correct me and I'll adjust the site.